In Hindi, gajar means "carrot" and achaar is translated to "pickle." These pickled crunchy carrots make a terrific accompaniment to just about any meal but are especially delicious with plain rice and yogurt. This recipe calls for kalonji, also referred to as nigella and black cumin. It is an annual flowering plant native to South and Southwest Asia which has numerous seeds that are used as a spice. Their flavor and scent is bitter and is similar to a combination of oregano, onion and black pepper. 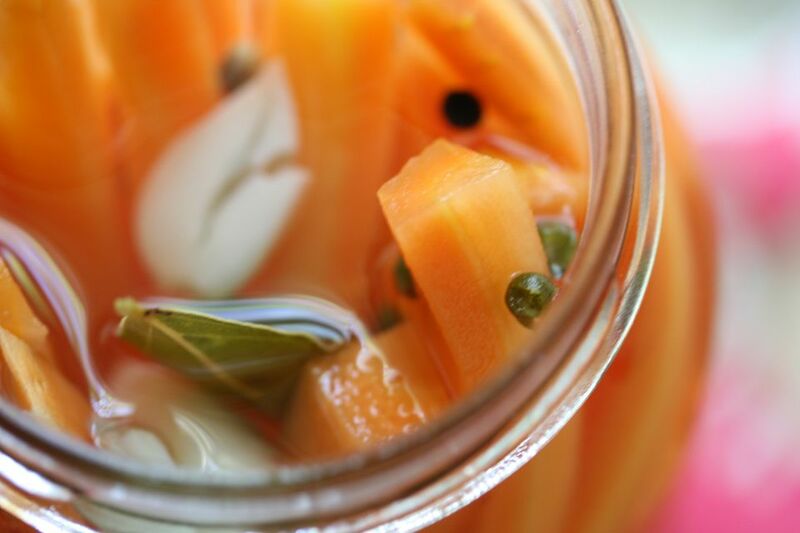 You will need to have a sterilized jar with a tight-fitting lid for the pickles, and plan ahead--the jar will need to sit in the sun for 2 weeks for the carrots to develop their pickle flavor. Cut the tops and tails off the carrots and then cut them into small 1/2-inch cubes. Heat the oil in a deep pan over medium heat, until very hot. Add the whole spices and fry for 30 seconds or until the popping and spluttering stops. Add the carrots, turmeric, salt and ginger. Mix well. Stir often and cook until carrots are slightly soft. Remove from heat and let cool. When cooled slightly, add the lime or lemon juice. Put the pickles into a sterilized jar with a tight lid. Keep in the sun daily for 2 weeks. This will cause the pickle flavors to develop nicely.